I dismissed it the first time around. This time I recognized it for the triumph of popular art that it is. Courtesy of Paramount Pictures and 20th Century Fox. The release and runaway success of James Cameron’s Titanic in 1997 was one of those cultural events that swooshed by me half-noticed at the time. I was a graduate student in the first year of writing my dissertation, and though I made time on occasion for a Maya Deren retrospective at the Pacific Film Archive, no way in hell was I going to sacrifice three hours to a schlocky, sentimental blockbuster that would force me to listen to that Celine Dion song again (for at least a year after the film’s release there was no public space that didn’t continually resonate to Dion’s glass-shattering pitch: “Near … far … WherEVer you are…”). Titanic (like Dion) represented everything that my broke, Walter Benjamin-reading colleagues and I shrank from: mainstream mega-success, the triumph of mediocrity. And however snobbish we may have been, we weren’t wrong when we noted with distaste how quickly every conversation about the film became a conversation about money: It had cost more than any movie ever made. It had made more than any movie ever made. Every day, it seemed, you read in the paper about a new record Cameron’s folly had broken. The gargantuan unstoppableness of Titanic as a global phenomenon recalled the supposedly unsinkable old ship herself—except that instead of exposing the hubris of its creator by sinking, Cameron’s Titanic kept going up and up and up. A few years later I did see Titanic, on TNT or one of those commercial-ridden basic cable channels, while distractedly sorting an immense pile of laundry. (As long as we’re doing true critic confessions, these were also the circumstances of my first encounter with Schindler’s List.) And though I remember being blown away by the fiery radiance of the 22-year-old Kate Winslet and gobsmacked by the climactic spectacle of the sinking ship, I continued to harbor received ideas about Titanic: It was at least half an hour too long (probably true on the small screen, where the staggering sequence of the ship sinking can’t be seen at the required scale). It was corny and melodramatic. (Indisputably true in any format, but kind of the whole point, no?) In short, Titanic was a trivial entertainment, unworthy of proper viewing conditions or focused attention—a movie to do one’s chores by. Fifteen years later, Titanic has been re-released in a 3-D conversion, in part to coincide with the centennial of the disaster (which took place April 15, 1912.) Now, as a professional movie critic wary of preconceived opinions, I’m chastened by the memory of my youthful (OK, I was 31) dismissal of Titanic. What was I thinking, an aspiring scholar in a cultural field, not going to see the movie that the whole world was talking about that year? And professional edification aside, why didn’t I want to watch two beautiful young people fall in love on a doomed ocean liner? What did I have against spectacle, or melodrama, or for that matter, popular success? In a last-minute substitution for the review of a new movie I was scheduled to write this week, I decided to plonk down the $18 admission (!! ), don the specs, and see the film as it was originally meant to be seen, and then some. I can’t say that the 3-D glasses had anything to do with it—I credit the simple fact of theatrical projection, along with the absence of laundry—but yesterday, for the first time, I finally got Titanic. Of course it broke box-office records worldwide! Of course 14-year-old girls returned to the mall to see it every weekend for a year! Cameron’s three-hour disaster epic is a triumph of popular art—of folk art, really. Its technological sophistication is in the service of a story so simple and universal it could be told in ballad form: a poor boy and a rich girl fall in love on the world’s biggest ship. The ship then promptly hits an iceberg and sinks, killing hundreds of innocent passengers and (spoiler alert for those who have never seen Titanic, or any other movie) separating the lovers forever. The second half of Titanic is a splendidly staged and paced disaster movie—even many of the film’s detractors will grant it that. But the first half is a no less skillfully constructed love story. 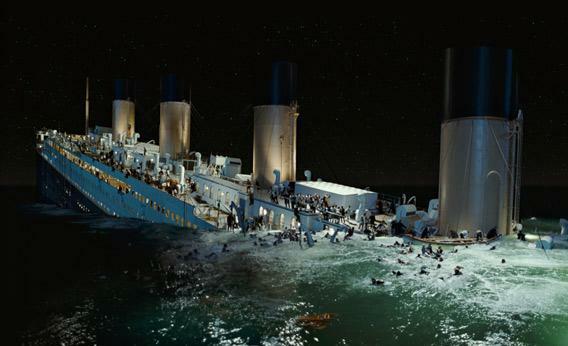 Just as the ship’s final crackup is cannily preceded by a present-day scene in which a geeky Titanic expert walks through a computer model of the accident, the shipboard romance between the cultivated young socialite Rose (Kate Winslet) and the penniless adventurer Jack (Leonardo DiCaprio) kicks off not with a meet-cute but a meet-dangerous: Rose, about to throw herself off the back of the boat rather than marry the awful man she’s engaged to, gets talked back over the railing by Jack. (Later, when they’re clinging to that same railing for dear life as the ship makes its final descent, she will remind him, “This was where we met.”) Far from being a moony-eyed gazefest out of a Nicholas Sparks novel, Rose and Jack’s love is presented as a matter of life and death from the start.